We got a few bikes in from the swaps in the midwest. my colleague Jacob made this photo. Yes, that is Curtis as Scrooge McDuck diving into the trailer full of bikes. Come pay us a visit and get the pick of the litter! SR crank set and road pedals with medium size steel toe clips and straps. 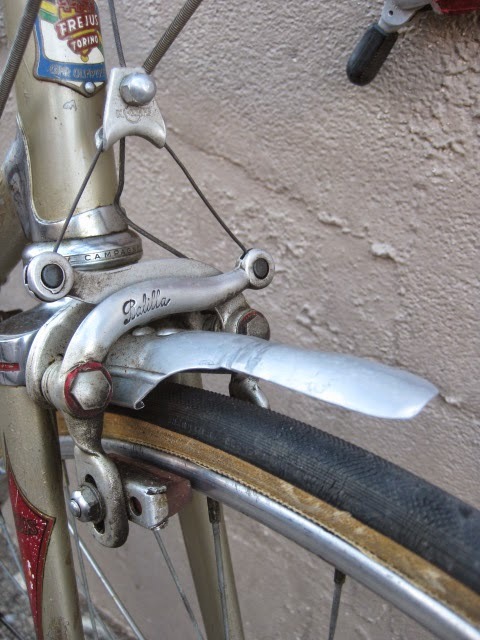 Galli brakes and brake levers. Campagnolo Nuovo Record low flange road hubs laced to a Mavic MA40 dark anodized rear rim and a Matrix anodized front rim. Cinelli 1R stem 100mm extension and Cinelli Giro D' Italia bars which are 40 CM wide with newer logos. The bike is light weight and solid. It could use a tune up and is not included in the price. I date the frame to about the mid 80's by the decals. The paint is a nice metal flake gun metal grey and sparkles in the sun. 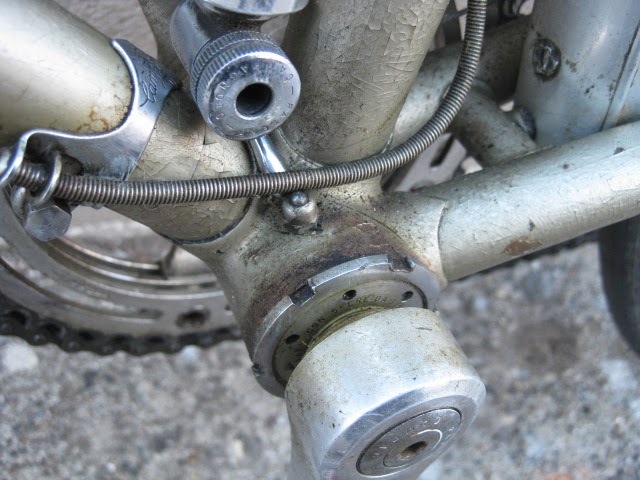 One of the top tube brake housing guides is broken off (see photo). Frame and fork are in alignment. Very nice starer road bike that is capable of pretty much anything. It also has eyelets on the forged drop outs for fenders and a rack., making it very versatile for daily commuting use. Price is $400.00. Please email at bikeville@gmail.com with any questions. Shipping and handling will have to be calculated depending on location. It's spring again, and I like to post a couple nicer bikes for sale here to try and make room for incoming bikes. 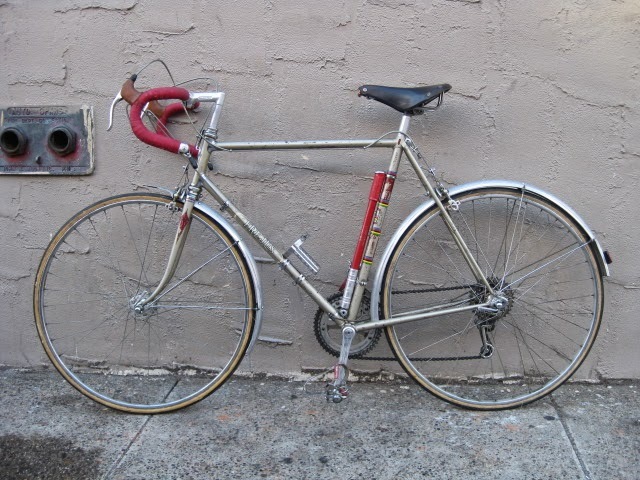 This is an excellent starter road racing bike for a more petite individual. Viner is an Italian company that makes and made high end road bikes. This is the Special Professional model, which was top end in its day. 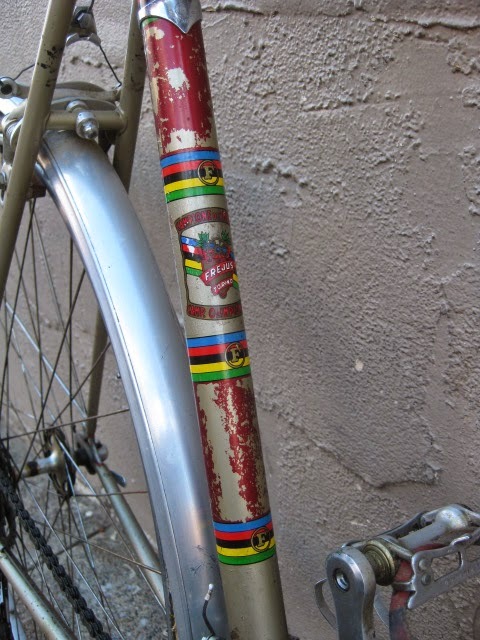 It has a 49 CM CTC seat tube, 52CM CTC top tube, and the stand over height is 30". i date this frame to around the mid to late 70's. Columbus tubing I assume as all the others I have seen also had Columbus tubing. The bike is very light weight. 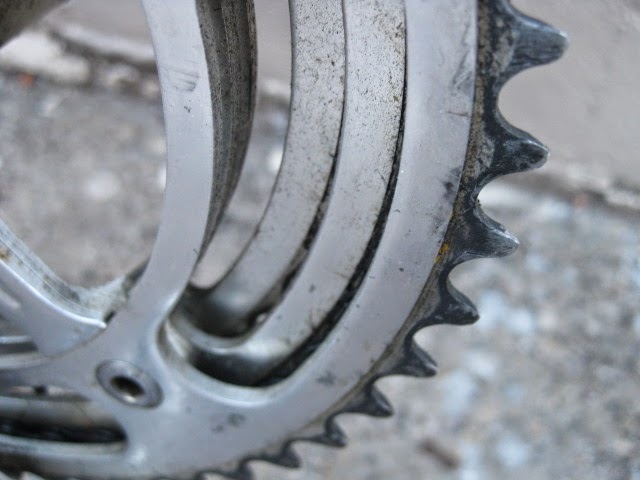 It appears to have a replacement fork of high quality with fully sloping crown. The original would probablly have had a flat crown with stars cast in the shoulders of the crown. Galli front and rear derailleurs, brakes, brake levers, cranks, shifters, and pedals. Specialized hubs laced to unknown double wall clincher rims which are 27". Some of the original decals are missing, and the paint is a nice light metallic blue. 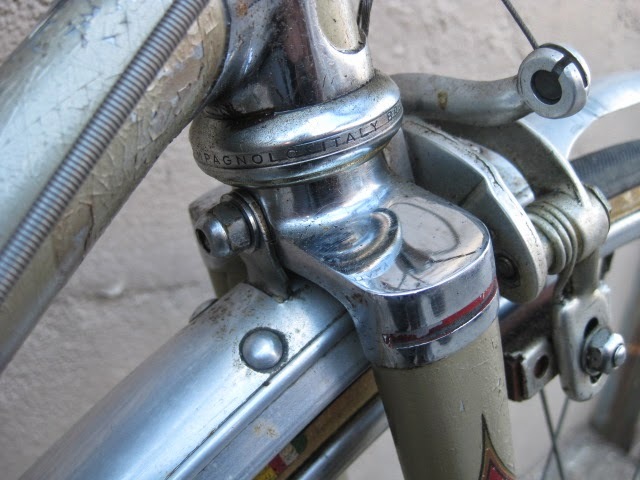 The lugs are nicely filed with cut out windows in pretty classic Italian styling. The bike needs to be tuned up and is not included in the price. 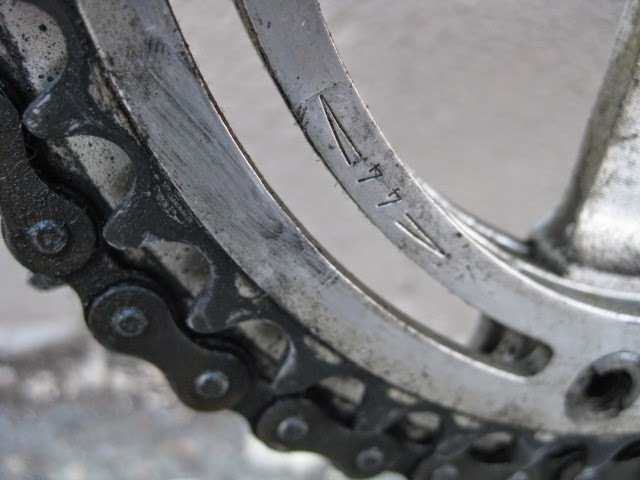 The bike feels nice and solid and the frame and fork are in alignment. Price is $600.00. Please email at bikeville@gmail.com with any questions. Buyer pays shipping and handling and will have to be calculated depending on location. Here is a link to an article about bike infrastructure in Philly and how it works. Recommended reading. link here! This is our friend Steven Rea's bike. he wrote a really awesome book called: Hollywood Rides A Bike Cycling with the stars. It is full of old photos of celebrities with their bikes. Really neat stuff, he did a lot of research and found some really cool images and stories .Here is the link! Check it out and support his efforts! I really enjoy seeing what our customer's bring in and this one is no different. Actually, it is a bit different because it is a bike I have always wanted for my collection. 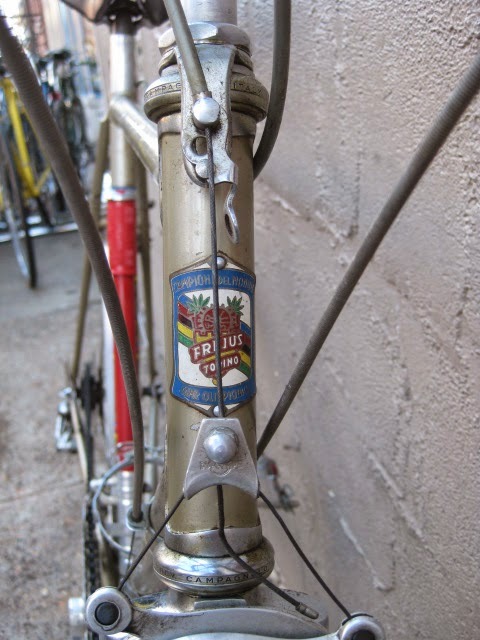 The bike is a Frejus road model and the owner dates it to about 1961. 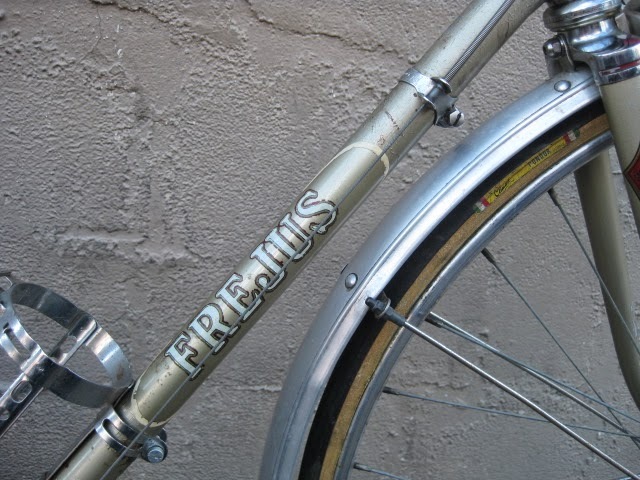 Frejus bikes were very popular in the USA from about 1945-1965. This one was imported to New York by a neighborhood shop in Stony Point, NY which was owned by the late Thomas Avenia. His shop became well known for importing Frejus and Legnano bikes. 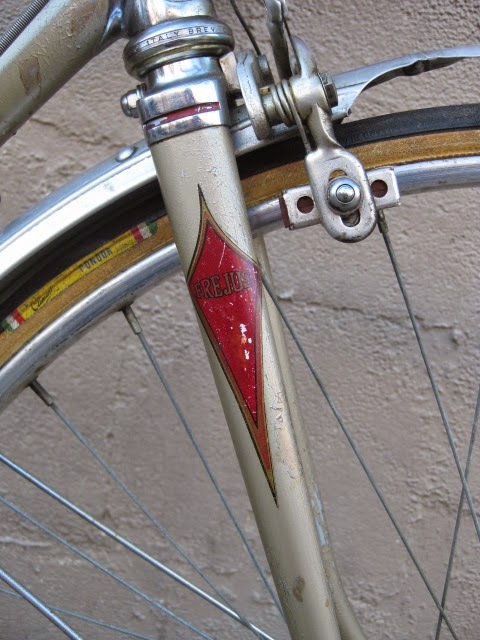 The top end models had a grease port on the back of the head tube and many classic Italian features. 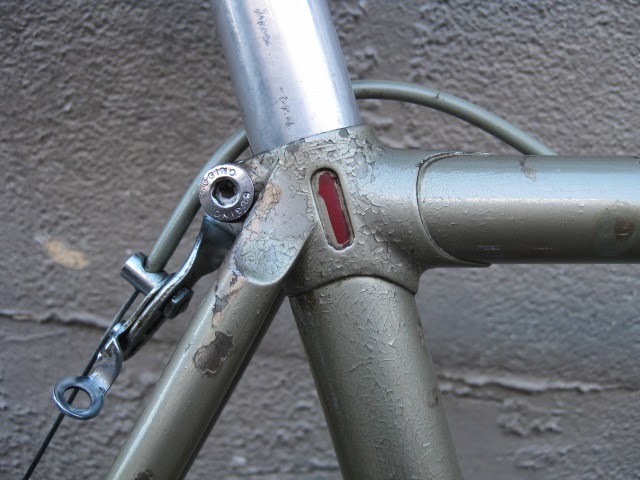 Some of which are the seat lug that utilizes a seat collar to tighten around the seat post and the simple and elegant head lugs as well as the semi sloping fork crown with slim cut out windows. This bike has all those features with the exception of the seat collar. 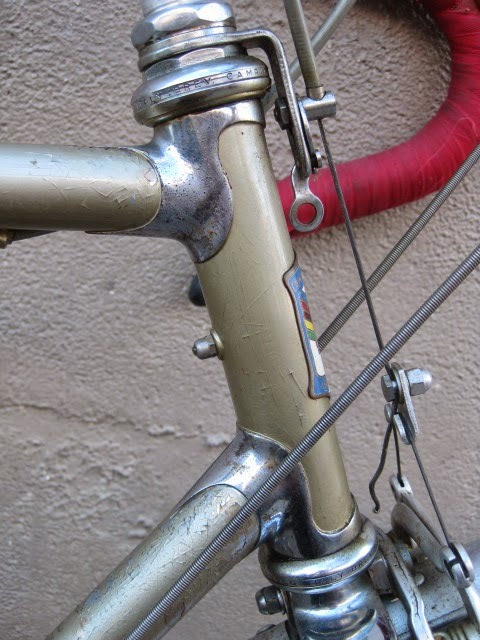 The patina on this bike is perfect in my opinion and shows it is a reliable and well ridden machine. 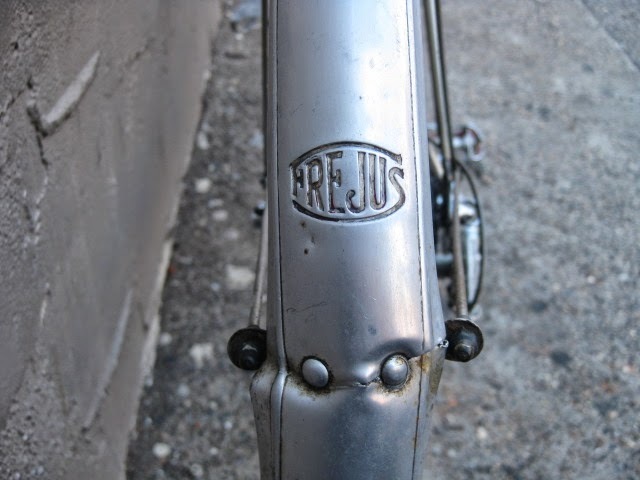 A nice touch is the Frejus stamped alloy fenders, very sturdy and sharp looking. 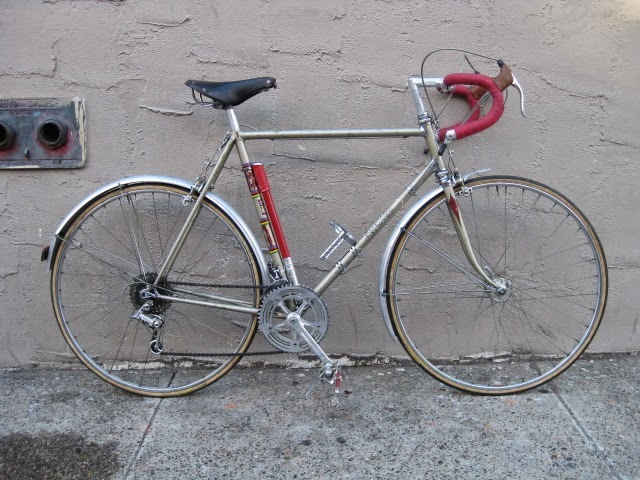 The bike also has a full Campagnolo Nuovo Record group with the exception of the Suntour Bar con shifters, which i like better anyway and the Balilla center pull brakes and levers. 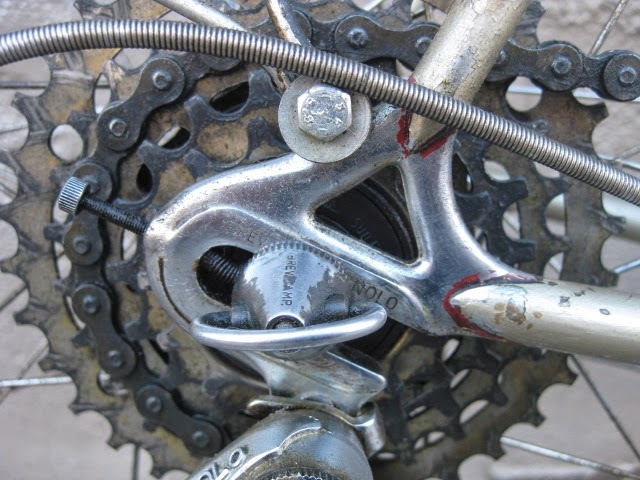 It also has the second generation Campagnolo Rally rear derailleur with the reinforcing tab which made it more substantial. Earlier versions were somewhat prone to breaking. 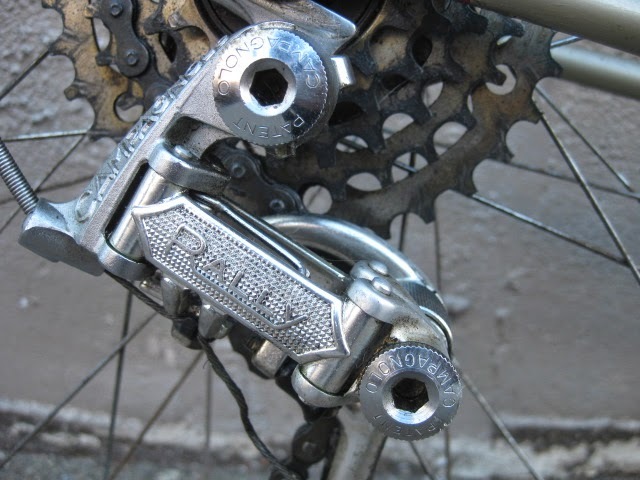 The Rally was Campagnolo's attempt at a touring derailleur, but also suffered the poor shifting of the Nuovo Record because it did not have the benefit of a slant parallelogram. Still, it is a classic of the era. 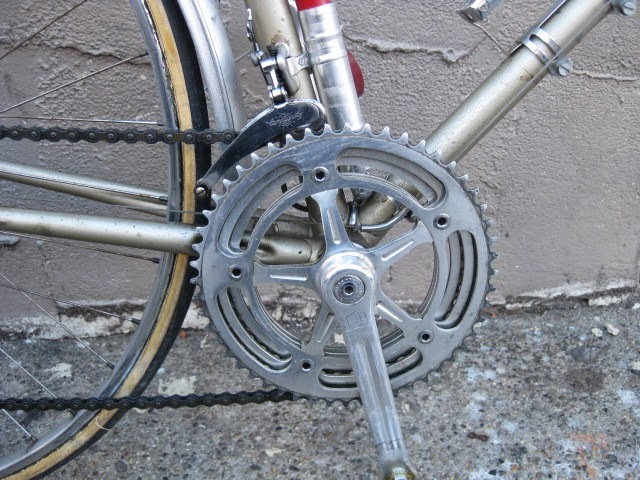 Also of note is the Campagnolo triple crank set with half step gearing, somewhat unusual. 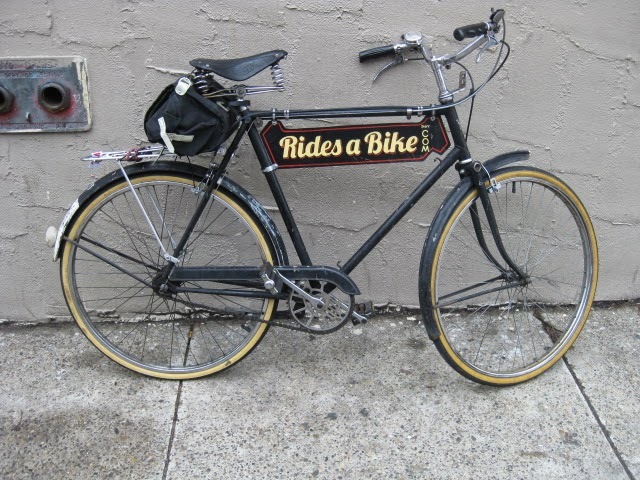 The owner says it is among his favorite city bikes and enjoys riding it on a daily basis. Perhaps some day I will find one in my size.